What, Who, Where, When, Why? We are a newly created hedge fund that started from humble beginnings as a university project. The fund has grown literally 1000-fold in terms of AUM, and has produced nearly 100 fold returns in 2017. My name is John Chalekson and this is the second hedge fund that I have formed in my career. At age 23 I started Rockfish Capital LLC, which ran for 3 years and then closed due to some black swan type swings in the derivatives markets. From an early age I always admired my cousin-in-law’s brother who runs BlackRock a $5.7 Trillion – the largest investment management firm in the world – and ever since Rockfish finished its run I have been researching emerging asset classes for opportunities where I could found the next BlackRock. So as a fundamental aim of my fund, we want to be the asset managers for digital currency and smart contract assets. The investment into these assets is somewhat daring, but as we march forward into an increasingly technology saturated world, it is clear that digital currencies are going to replace fiat by and large, and cryptocurrencies are simply the best-designed digital currencies. We live in very interesting times and people need to become more aware of the changing investment landscape. It is crucial for investors to open their eyes to new forms of investment opportunities. Cryptocurrencies are currently the asset class, as they are effectively a low-risk, high-yield emerging market sector without geographic limitations. I understand that this sounds crazy, low-risk investments ought to have proportionally low-yields, but right now the world and its financial systems are at the beginning of a major transition, the type of which we have perhaps never entirely witnessed before other than with the implementation of widely distributed, government-backed fiat, which is a technology that is coming to the end of its lifecycle. Cryptocurrencies are all about Value: in 2008 during the financial crisis I began to wonder, “what is money really?” This lead me investigate the Federal Reserve and the role of central banks in our monetary system to a further degree than merely keeping tabs on interest rates to place derivatives bets. What I realized, is that the old fiat monetary system is on its last legs, and its natural evolution will be to turn into a Cryptocurrency-based monetary system. Of course, I’m not saying that this is going to happen next year, or even in the next 5 years, but what is clear is the shape that the future of the global monetary system is going to take now that more banks, and institutions are adopting Cryptocurrency technology. To understand why we are at the beginning of a monetary revolution you just need to grasp the foundations of bitcoin – the original cryptocurrency to which all other cryptocurrencies are pegged – really. Money is basically an accounting system of who owns what, backed by a trusted 3rd party, which has essentially become governments. Meanwhile, central banks have been colluding with governments to manipulate this monetary system for particular reasons, political, profiteering, and otherwise. In the end, money is really just a massive system of accounting, with as much objectivity as possible ideally – it’s simply the technology we user to determine where value is, and who owns it. With the fiat system you need someone who can operate as a trusted issuer to make a currency function. You also need central banks to then set lending rates to commercial banks to get the fiat to people, investors, etc... But now cryptocurrency technology allows the recording of transactions and transferring of value digitally on open-access ledgers, which effectively ends the necessity for fiat currencies because the added costs of the central banking system and government backing no longer exist. Cryptocurrencies simply produce the accounting system that is money for cheaper, and at a faster speed than any fiat system. Blockchain technology implemented into all cryptocurrencies allows for monitoring and updating of a public, global ledger on a consensus basis so that there is never a need for a 3rd party. This is really a REVOLUTION because it means the high fees, inefficiencies, corruption, and risk that centralization has had can all be eliminated. In simple terms, that means that the more efficient cryptocurrency monetary system will be much more efficient, and thus produce a greater value than the old fiat system, which it is sure to replace. Fascinatingly, the original cryptocurrency, bitcoin, was launched just 2 weeks before the Lehman Brothers collapse in 2008, where the whole old school centralized fiat system nearly collapsed, except for significant government interference. What the crisis showed was that the existing system has some major flaws deep within it. Everyone sort of knows that the system can’t go on forever, that there are more 2008’s ahead of us, but the average investor doesn’t know that cryptocurrency technology is the answer to getting out of that system. 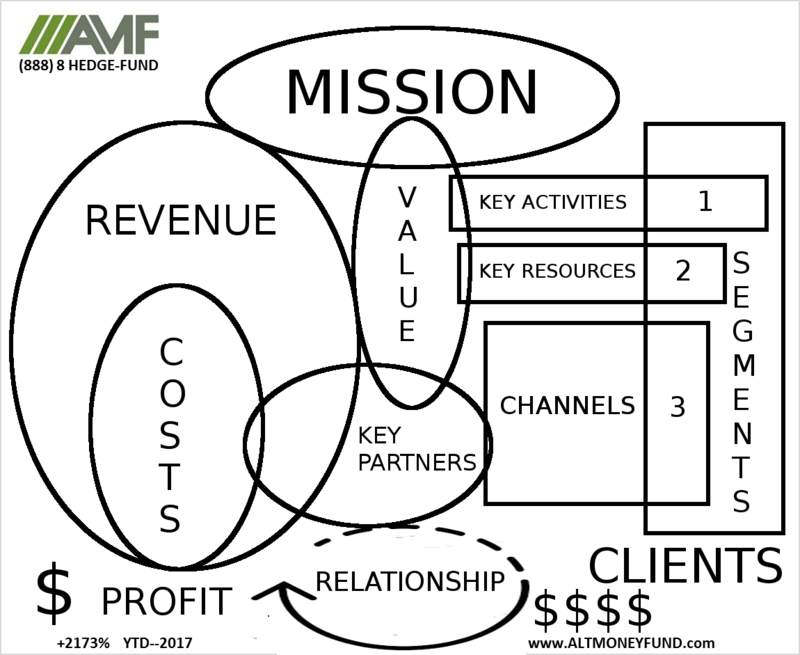 What we try to do here at Alternative Money Fund Management is identify cryptocurrencies that have not only a promising future fundamentally, but are sound technically and we are able to profit in both the short and long term from the high volatility associated with this new asset class so that we can control as much of the value in the new digital currency future for our clients as possible. Alternative Money Fund, LP® is a crypto currency hedge fund that is committed to provide exceptional returns through an actively managed portfolio of blockchain assets. With the emergence of Bitcoin, Altcoins and this exciting new technology has created a new asset class for investors. The volatility associated with the cryptographic verification and game theoretic equilibrium, these blockchain-based digital assets create valuable opportunities in an actively traded portfolio, Our trading strategy does NOT use leverage or margin. Returns are reported monthly and capital accounts may be increased or redeemed each month. Blockchain tokens are emerging which add a monetary incentive layer to p2p protocols and facilitate equity crowdfunding that anyone in the world can participate in. This means for the first time, open source software developers can monetize their networks at the protocol level, and users of the network are the equity owners of the network. In this model, disproportionate returns go to holders of the tokens rather than investors in private companies built on top of the protocols.